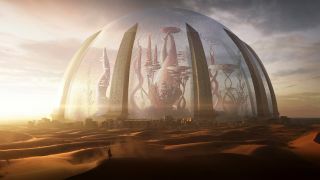 A Crisis, in the context of Torment: Tides of Numenera, is an attempt to "bring the same sense of reactivity and choice and consequence that is the hallmark of Torment dialog into our turn-based gameplay," as Lead Crisis Designer Jeremy Kopman explains in this new gameplay video. "When a Crisis kicks in, your goals aren't limited to bashing in the brains of your enemies." The video begins with what looks like a fairly straightforward fight, but things get interesting once the fists start flying. In one instance, the death of an enemy NPC leads to a dangerous situation that must be addressed while the fight is still underway; in another, the same NPC opts to surrender when he sees the battle turn against him. It's even possible to engage him in conversation, although probably not of the friendly sort, in the middle of the fight. Each Crisis will be a "hand-crafted scenario where we can offer high levels of reactivity, shifting states, and human-feeling AI," Kopman says. "There won't necessarily be one best solution in any Crisis, and your tools will range from brute strength to unique Numenera abilities to social skills and conversation. All of these will influence the outcome and let you pick your play style." It's more than a little reminiscent of the famous boss fight at the end of Planescape: Torment, which with some luck and skill could be talked through rather than actually fought. Even though Numenera is still in "early alpha," this video looks very promising—and definitely the kind of Torment I'm looking for.